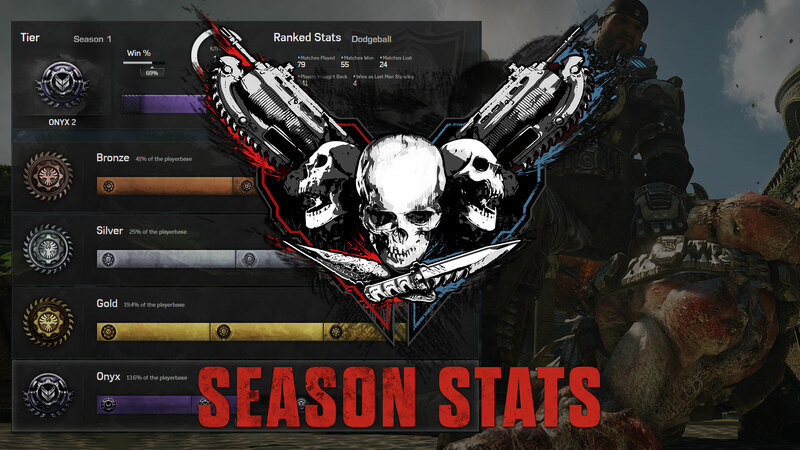 Gearsofwar.com season stats have arrived! When visiting your stats, the first thing you'll see is your Player Overview featuring your Gamertag, XP Level, Overall Experience and Re-Up level. Underneath, you can select between different playlists to get an overview of your performance on a per-playlist basis. 2: Your current place in the Tier. The percentage reflects how much progress you've made within your Tier, and how close you are to promotion. The shaded area of the bar denotes you are at risk of Demotion from your Tier. 4: The Tier Breakdown lets you see where you stack up in the community. Each Rank represents segments of the playerbase, providing an up-to-date look at where you sit in the overall Community. In addition, you'll also see your Progress in individual Tiers reflected here. At the bottom of the Season stats, you'll find your Season 0 Placements captured for all time. We'll continue to keep records of previous Season Placements moving forward so you can see how you progressed over time. Gears of War 4 uses a TrueSkill algorithm to build out player ranks in-game. We have worked with Microsoft Research to help enhance this functionality in-game to build out player ranks in-game. We have worked with Microsoft Research to help enhance this functionality in-game. How does this work? It’s fairly straight forward! The higher the skill rating of a player (tier), the more likely they are to win a match. The greater the difference between opponents, the more likely the higher one will win. It also keeps track of how confident the system is of the player’s skill. Over time, it gets a better picture of your skill level. The ranking system is entirely skill based. You must both win and perform well individually to achieve the highest rank. Your rank indicates your likelihood of contributing to a win. If you beat opponents that are lower skill than you are, you won’t really move up that much, if at all. If you beat opponents that are higher skill, you move up faster. If you don’t win and don’t perform, you won’t rank up, in fact, you may start to move down! Each mode uses a different set of weights to measure individual contributions to create the most accurate skill prediction. Even if your team had a rough game, your individual performance does matter and can help reduce or negate a reduction in your tier placements. TrueSkill uses a number to communicate skill. We have bucketed these in 13 tiers to allow for much easier comparison. This is due to TrueSkill actually being two numbers, a rating and a confidence. As the system becomes more confident in your ability, it will place you in the correct bucket. What does this mean? To get into the higher buckets, you will need to consistently win and maintain winning against people of similar or lower skill. Calculations occur at the end of a match, but every round is considered. It is important for people to perform well in each round to rank up. To rank up the fastest, you want to beat your opponents in as few rounds as possible. For example, winning 7-0 in Escalation is much better than winning 7-6. The calculations also occur in the ‘cloud’ so there will be a delay from the end of the match to when the update will happen in the UI. This will be the same for the tiers site. We recommend checking a couple times a day to see where you are landing in your tiers placement. Each tier contains a target percentage of the user base. The target for Diamond is a very small percentage of the player base and grows as the tiers move to lower skill levels. There is no rank decay over time, however, as new players enter the tiers, the bucket expands. If you don’t keep playing, you may start to fall as the tier buckets get bigger and bigger! Matchmaking in ranked playlists will always attempt to find an even match for users. If it is unable to find a match within a specific amount of time, it will begin to expand its search until it does find a match. This is the same for pre-made groups. We will always attempt to find a group of similar skillset as your pre-made group but if none exist in your region or on your playlist in a set amount of time, we will expand it out to other individuals who are searching as well in other tiers. People in placement matches may also not be lower skill than you are. These players are still being evaluated on where they will be placed for their starting tier. Your goal is to perform the best you can! Get kills, score objective points, win as fast as possible, stay consistent and improve to move up the ranks in Gears of War 4! 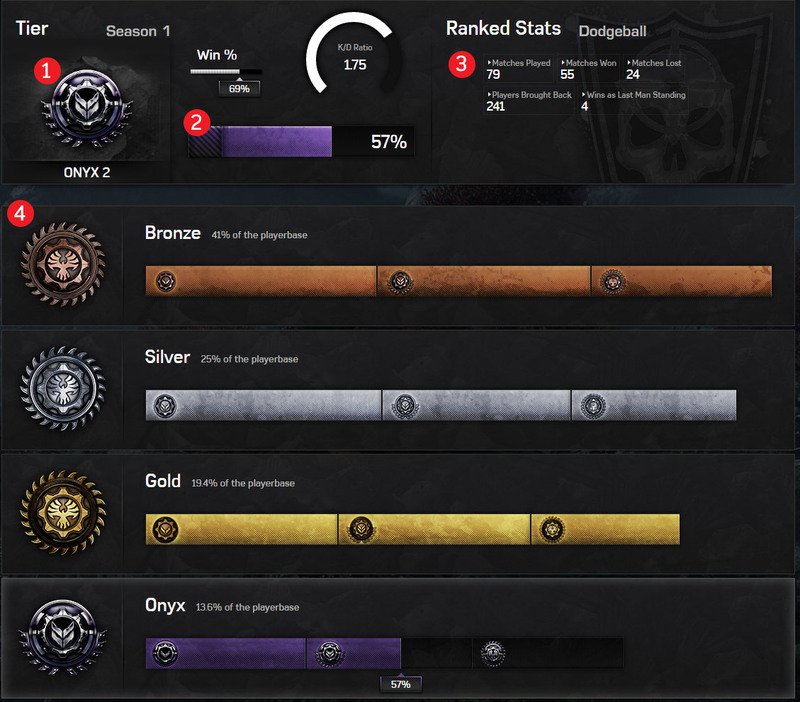 With this update, we've moved Stats to the navigation bar so you can easily find it every time you visit GearsofWar.com. Further improvements are also on the way for Stats including visual improvements like animations, and new features that allow you to see your friends placement information. Looking for our forums? Forums have now been moved under the Community Resources section under Community to make way for stats. Our Community Hub is also the best place to find all the latest news, events and features coming to GearsofWar.com, so it's a great destination to hit up before jumping into the forums. Want to be able to head straight to the discussion? Bookmark our forums for easy access! We'd love to know what you think of the new Seasons experience on GearsofWar.com. Let us know your feedback by tweeting @CoalitionGears on Twitter! The Gears Pro Circuit heads to Paris next week, and we're celebrating with major increases to the Match Completion bonuses in Escalation! Feral Horde is back for April and May with Double Class XP this weekend! Also: The Marcus Pack returns, and Bernie is now Craftable. The Carmine Brothers are back... from the dead! Collect Zombie Carmines in this new Pack plus an update on incoming "BRAAAAAAINS" changes.